We're bummed to see you go. If this happened on accident you may click here to re-subscribe. Either way, have a great day! We encountered an unexpected error and were unable to unsubscribe you. Please email us at hello@findkismet.com for further assistance. So glad to have you back! If this happened on accident you may click here to unsubscribe. We encountered an unexpected error and were unable to re-subscribe you. Please email us at hello@findkismet.com for further assistance. We encountered an unexpected error and were unable to pause your introductions. Please email us at hello@findkismet.com for further assistance. We'll stop sending you intros for 5 days. If this happened on accident you may click here to unpause your intros. So glad to have you back! If this happened on accident you may click here to pause your intros for 5 days. We encountered an unexpected error and were unable to unpause your introductions. Please email us at hello@findkismet.com for further assistance. We'll send you an email intro ASAP. In the meantime, take a minute to fill out your profile. It's optional, but your intros will appreciate it. Please use full URLs for easy clicking! 1. Enter your HN username (case sensitive) Note: Your HN account must have at least 1 comment or submission to use this form. If yours doesn't, please email your HN username to hello@findkismet.com and we'll get you set up. Go add the code to your HN profile; we'll wait. This might take a couple minutes. We ran in to an error signing up. Please check your HN username and ensure the code is in your HN profile. 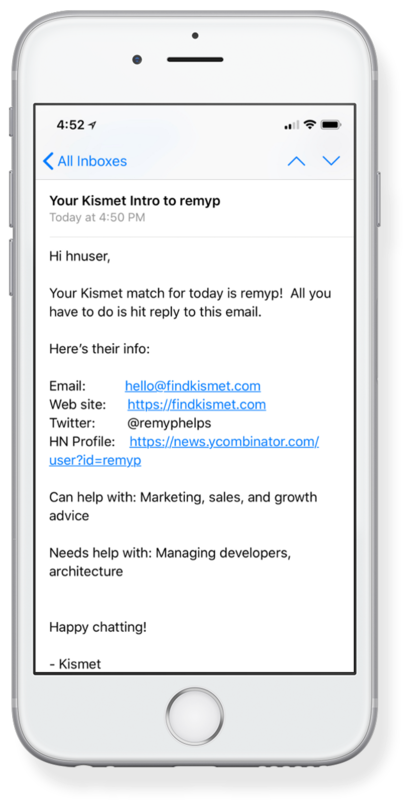 For help, shoot an email over to hello@findkismet.com. Already a member and need to update your profile, pause your introductions, or unsubscribe? Enter your email and we'll send you a magic link. The guy behind Kismet is Jeremy, who builds software and is also writing a book. Feel free to say hi or follow him on Twitter @remyphelps.